Exhibition: «Battle of the Bulge, Bastogne, Winter 1944 », at the Airborne Museum. December 16th, 1944, Hitler ordered a major German offensive campaign to take back Anvers harbor and stop Allied advance. The surprise attack caught the Allied forces completely off guard: it was sudden, quick and efficient. Decisions had to be made: General Eisenhower sent reserve units from France in reinforcement. The Battle of the Bulge was a very exhausting (physically and emotionally) and deadly experience for the Allied. These men had to face extremely cold winter and a lack of food and ammunition supplies. The defeat of German Army has happened after a salutary break: supply could reach ground troops and eased General Patton arrival. The Battle of the Bulge lasted until end of January 1945. This exceptional exhibition also enhances the “Way of Liberty”, starting from Sainte-Mère-Eglise, Normandy with “Borne 0” and ends in Bastogne, Belgium. A part is dedicated to General Patton’s role in The Battle of the Bulge. Included in museum entrance fee. 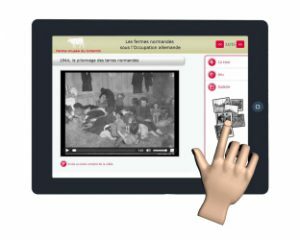 Thanks to a touchpad, while walking along the museum, see how life and work went on in the farm during these times of restrictions during WW2. Accessible to people with hearing or seeing impairments. Extra fee: 2 € / touchpad. Exhibition “Ces hommes là” by Adeline Keil photographer. Thanks to these photographs at men’s height, meet veterans of Utah Beach Landing divisions. Stare at their eyes and imagine their emotions in June 1944. Apart from Foucarville and Ravenoville inhabitants, only a few people knows about the German prisoner camp set there between 1944 and 1947. It was called: “Continental Central Enclosure n°19 » and was built initially for 20,000 men but was enlarged to welcome 60,000. A real town has been built with time with electrical lighting, roads, toilets and bathrooms, water supplies (600,000 liters per day) and a railway. Presented in French, English and German.